Stems: Erect or ascending, 1-several, usually unbranched or occasionally few-branched below inflorescence, glabrous, glaucous. Leaves: Basal and alternate on stem; basal and lower stem leaves long-stalked; stalks to 3+ inches, narrowly winged; upper stem leaves reduced, sessile; blades broadly egg-shaped to elliptic or spoon-shaped, 2 to 8+ inches long, .6 to 5.2 inches wide, thin, pinnately veined, glabrous; undersurface often glaucous; tip rounded or blunt. Inflorescences: Cymes, compact, terminal, flowers often drooping. Flowers: Stalks 1/12 to 1/5 inch long; calyx 5-lobed, to 2/5 inch long, divided halfway to base, greenish-purple, glabrous; calyx lobes lanceolate to oblong-ovate; corolla salverform, .75 to 1.6 inch long, shallowly 5-lobed, blue, pinkish in bud; stamens 5. Fruits: Nutlets 4, angular egg-shaped, 1/8 to 1/6 inch long, dull to dark brown, wrinkled. Habitat: Moist woodland clearings, stream and river banks, bottomland woods, bases and ledges of bluffs; shade or partial shade; rich, moist, sometimes rocky soils. Uses: Native Americans stepped the roots and took the liquid as an antidote for poisoning and to treat venereal disease. 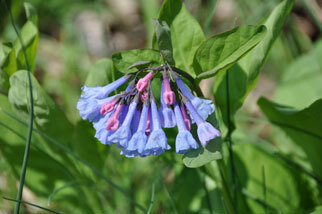 Bluebells were also used medicinally in treatments of whooping cough and tuberculosis. Comments: Bluebells are often cultivated as an ornamental and sometimes escape. The genus is named for the German botanist Franz Karl Mertens, 1764-1831. After the fruit matures, the aboveground portion of the plant withers away.